“To me, our emotional/psychological response is *the* story on climate change. It defines how (and if) we will solve the problem”. In scientific circles, emotional impact is rarely discussed. Eric also gave up flying, something which led to Fox News branding him a ‘kook’ (respect), and talked publicly about that too. 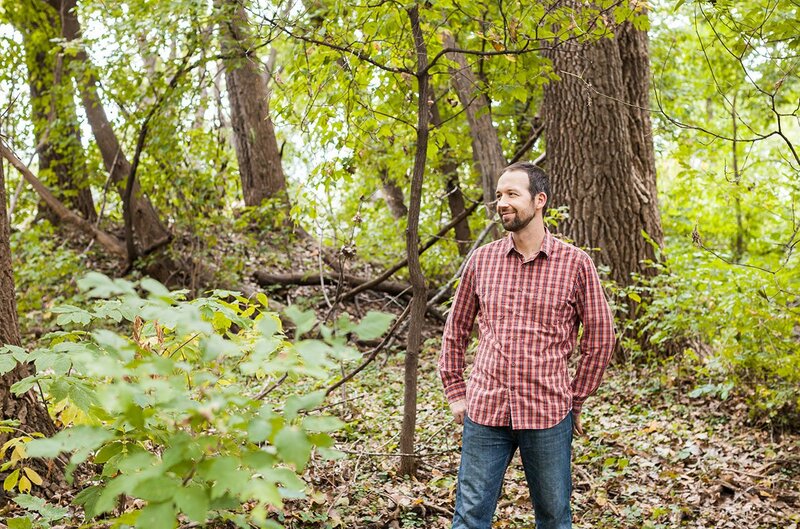 He writes regularly for Grist, and describes himself as a “dad, husband, beekeeper, game maker”. It was in an article about Eric that I first came across the term ‘pre-traumatic stress disorder’, a topic we’ll explore more in a future podcast. How does that impact the imagination, I wondered? So, when I chatted to Eric, I started by asking him to tell us a bit about that journey he went on, of injecting very real human emotion into a field that usually limits itself to facts, figures and data. “The whole time I just feel like I need to figure out how to match what I’m feeling with this stuff that I talked about. This mismatch of what we need to do and what we are doing. There’s a lot of emotional fall out from that. At least that I’ve been feeling. It seems, especially in hindsight, like such a luxury. The vast majority of people on earth will never set foot on an airplane and yet we have circles of people who couldn’t imagine their lives without it. It seems like a fundamental inequality of our time and that’s exactly the sort of thing that needs to be rethought in a world that is constrained by climate change. Over the last few years or so since I made that decision that really it’s changed the way I see the world. It’s brought me to think of the world as a much larger and more fascinating place than I thought before, and to focus more intently on the places that I live, and the people around me, and places to take vacation that are within 100 miles of where I live, rather than thinking I have to cross an ocean to go for a week’s vacation. Any time you can see the world in a new way, that seems more in line with reality, that’s a good thing. That might get a little bit to your question about imagination, that so much of what we experience in this really weird early 21st century – weird in historical context, I mean, we do things now that are almost like magic even considered 50 years ago – it just seems like we take for granted how quickly the world is changing and how strange our world is in terms of instant communication with pretty much anyone on the planet. Both the potential and the problems are greater than ever before, it feels like. At the same time, we are solving problems pretty quickly too in terms of poverty and human health and public health. Those problems are being solved very quickly, but we are substituting them for larger problems. Given that context of this weird world that we’re living in, so much of what we assume to be true actually isn’t true. They’re just received truths. They’re, “This is how you build a city” or, “This is how universities work” or, “This is what a road looks like”. These are all accepted as true that aren’t necessarily true at all. Not even remotely true. There are so many different options for how to practice education or how to transport ourselves, or how to organise a democracy. We don’t have to always continue on with the system that we have, especially if that system is broken. That is what climate change is making easy for some of us to realise, that given the necessity of radical change, it gives us an excuse to rethink virtually everything. I look to someone like Elon Musk, who is a problematic figure in some ways, but in a lot of ways is a model of the 21st century visionary in the way of saying, “This is how you build and operate a space programme”. He’s spent a half a billion dollars in five years to, from the ground up, create an entirely new rocket and way of getting into space, that’s an order of magnitude cheaper than anything ever done before, and reusable from that point, with less carbon footprint. In the same time NASA has developed – actually in twice that time – NASA has spent the same amount of money to develop one single launch pad in Florida. And it turns out, they may actually have to scrap that launch pad. When you get into an institutionalised way of thinking, there’s a lot of waste of time, and a waste of money, and a waste of brain power, of creativity that goes along with that. There’s a lot of people in the climate community that are looking to institutions like the Government, or like NASA, or large-scale institutions to come up with some sort of silver bullet solution. You know, “Surely these are the people that know the problem, and if we only elected the right mix of representatives, the Congress, that surely they would pass the perfect climate legislation and we’ll all be saved.” But I think that that’s really delusional at this point. We’ve gone 30 years with that mind set, and if anything the problem’s gotten much worse. I am taken with the notion of ‘pre-traumatic stress disorder’. It strikes me that most people are aware, on some level, of climate change. Particularly younger people who’ve grown up with it in school and it’s just part of everything. Firstly, how do you see pre-traumatic stress disorder in relation to climate change manifesting in the world around us, and do you think that that climate denial is in some ways a manifestation of pre-traumatic stress disorder? Yeah, really I think so. Inaction, or doing small actions like recycling or taking your reusable bag to go shopping with you, those are also forms of denial. Any time we’re not acting on the scale necessary to solve the problem, these are all ways of tricking ourselves to think that either the problem’s not as big as what it is, or that we are powerless to solve it, or that our actions are having some effect. They’re all coping strategies for us to avoid imagining that change that’s actually necessary, or imagining the world we want to have. Sometimes it’s easier to just say, “Oh well, this is just too big of a thing”. Accepting failure is a way of denying that we have a chance to change that future. Thinking that someone else is going to somehow solve the problem is also a way of denying our own responsibility. Change also is a trauma for a lot of people. Especially radical change on the scale that scientists say is necessary. It’s a scary thing to think about. It’s scary to think about, especially if you don’t see any of your friends acting like it’s a big deal. There is research that goes along with that, that at least in meteorology, where I was trained. There are studies saying that in order to take shelter in a tornado warning, you need to have a signal from scientists, or from some official source, that the tornado is real and it’s heading towards you, and that needs to be someone that you trust. But also you need to verify that with someone directly in terms of I need to physically talk with someone nearby, or see other people taking action, before I take action. There needs to be some sort of visual or personal communication to verify in our brains that this is a major disaster that’s imminent, that I need to drop everything and take radical action. I feel like we’re in a similar scenario with climate change. It’s really clear that very, very few people are radically changing their lives, or even advocating for radical change. Even fewer are trying to do that in a way that matches the way our brains work, that we need to be doing this together as a community. That’s the only way that we will be able to convince ourselves that it’s a real thing. Increasingly you are able to look at your window and see the direct impacts of climate change. We all have little signs that those things are happening, like an early spring, or hearing about it on the news more recently. Do you have a sense that the further we get into it, and the more it becomes manifest around us, and the more people experience traumatic extreme weather events, that the further we get into it, the less likely it is that we’re going to be really imaginative? The further we get into it, the more our imagination contracts under that sort of pressure, the less likely it is that we can design a really imaginative way out of it. Does that resonate with you? Does that feel like a good analysis? You’ve done a lot more research into this exact question than I have, but I would imagine that, say 10 years from now, maybe we’ll see the first ice free Artic summer in the next 10 years. Or we’ll see some tremendously major tipping point starting to change. We’re already seeing things that would be considered tremendous 10 years ago, I would say, with flooding and fires. It’s really happening quicker than people would have thought 10 years ago. The studies in Antarctic are also really terrifying to me personally. But the more those sorts of narratives are pushed forward, the sort of, “It’s too late, because look at all the stuff that’s already happening” – and on our current path 2oC is almost impossible at this point – moving the goal posts will continue to happen because the goals we accept are really incompatible with the way we’re solving the problem, or trying to solve the problem. So that mismatch will widen, I think, which gives more opportunity for that sort of cognitive dissonance. Our brains are constantly being encouraged to give up, I feel like, by the stories we’re telling ourselves. When I heard you summarise your theory, or your read on this problem, I thought back to survival instincts. 10,000 years ago if you’re being chased or something, and you’re in an emergency scenario, it makes sense that your brain would shut off parts of your thinking to focus on the present and surviving the present. At the same time it feels like there is an evolutionary advantage to creativity in those emergency scenarios too. You need to be able to think quickly and respond and react to what’s happening immediately right in front of you. It’s partly my job as a journalist, or your job as a storyteller of what a vision of the future could look like, or what a vision of a response to climate change would look like, to say this sort of dystopian “All is lost” vision is only one possible future. It’s definitely not likely. I mean, it doesn’t have to be likely. And it’s definitely not the only possibility. I’m just honestly not sure why society keeps reinforcing that vision, rather than reinforcing a more positive vision of the future. It’s usually matched with technology though, the positive vision of the future. So saying we will overcome all of our earthly constraints because of technology. There’s obviously problems with that too, with unequal access to that technology and what the consequences of developing that technology have. I don’t know if you’ve read recently – I think it’s a forthcoming book, or maybe it’s already out – with this idea of Prophets and Wizards, in terms of looking at the future, a degrowth or a technological response to climate change. Either we get these new magic energy machines that are zero carbon as quickly as possible, and spend whatever it takes to get there, or we retreat and focus on cutting emissions as quickly as possible because that’s the only option that makes sense. Both are rational, and both of them are reasonable approaches. I’m just wondering if there has to be some sort of blend of those in order to paint a more inclusive vision that’s hopeful that appeals to everyone. One of the things that you wrote about recently was about Trump’s attempt to eradicate climate science, which you called the ‘21st century book burning’. There’s that sense of you can only really imagine the future if you have some kind of a grounding in the past. What impact have you seen that having in the climate science community, that assault, over the last year? There’s a natural defence that scientists are defending their work and trying to explain why it’s important, but they’re also more fundamentally finding a political voice and saying that the vision of the future that we want to have is a vision that respects truth and that respects knowledge and that respects that past, the work that we’ve done to understand the past and understand why we are where we are and use that to inform what needs to happen in the future to make a world that works better for everyone. If anything I feel like this assault on imagination, assault on truth, and co-ordinated effort to instil that future that benefits only the select few, I think that that is having, at least immediately, having a counter effect of empowering people to make their voices louder. But that can’t continue for ever because at least for the moment – for the moment meaning the last 30 years – the people that are really in charge have been really good at making sure that status quo continues. I don’t know, I keep going back and forth with what would it take to break that spell and how, because I don’t think it will look like one specific person standing up and saying, “Here’s the vision that we have to work towards”. It’s going to be everyone feeling like it’s achievable and hopeful and necessary and appealing enough to do it themselves. Because this problem’s so big that it has to be done from all sides, by everyone, starting right away. And the only way that’s going to happen is if it seems like it’s something in someone’s best interest that they do themselves. There’s a question that I’ve asked everybody that I’ve interviewed for this project, which has been, if it had been Eric rather than Donald who had been elected President a year ago, and you had run on a platform of ‘Make America Imaginative Again’, and you had seen that actually it was of vital importance, whether you’re talking about education or business or science or whatever in community life, that revitalising people’s imagination and sense of possibility was fundamentally the most important thing that had to be prioritised over the next five or 10 years, what might you do in your first 100 years in office? That’s a good question. Direct participatory democracy at the local level, in terms of groups of people, 5-10 to 100, meeting together to talk about their hopes and dreams and how to make it happen, is probably the most important thing that we could be doing right now. I don’t know how to incentivise that. I’m not a policy person. I’m not a marketing person or an activist or an organiser or anything. I don’t know how to get people excited enough to do that, but I think a world where that is happening is really hopeful. Do you have any last thoughts on the question of imagination and what I talked about at the beginning? Is there anything left unsaid? More than almost anyone, you probably have such a wealth of knowledge of following the movement that you started, and the kinds of solutions that are coming out of these communities … I would imagine that it changes peoples’ view of what is possible, when they see it happening around them. Again, I feel like that’s the theme that in my rambling answers I’m talking about. A lot of people’s vision of the year 2050 is suburbs exactly as they are now, but everyone has this weird gadget attached to your chimney that captures all of the carbon from your house. That’s like we’re living the same lifestyle except we just needed to buy this thing that was missing that fixes everything. That’s a lot easier to imagine than rethinking fundamentally every part of our life, even though our world is going through fundamental changes all the time. The internet I feel like is a fundamental change, or having the sum of human knowledge in your pocket at all times is a fundamental change. Or all of a sudden having a climate denier in the White House is a fundamental change. That happened over night. There are fundamental changes that can happen that are even necessary that feel like they’re impossible, but only because that’s what we’re telling ourselves. You know, saying, “Oh, that’s not a practical thing to work for.” Well, it might not seem practical if your imagination is limited to the way the world is right now. But again, I’m really excited for your book, because I’m interested to see what other people think about how to actually create a world where this imagination is fostered. Or how to make that happen. I might know that that’s necessary but I have no idea how to actually make it happen. very good interview, and Eric Holthaus has a lot to say and broader view than just meteorology.? Nice youtube ingreviw aswell, and very brave to make the decision not to even fly for his work. And like in hi tech or low tech I propose that we should do both, as mentioned is in this sentence: We must try to devellop new magic energy machines that are zero carbon as quickly as possible, and spend whatever it takes to get there, AND we retreat and focus on cutting emissions as quickly as possible because that’s the only option that makes sense. Brilliant interview – thanks for this work Rob, I am continually inspired by the people you are talking to with your research into the imagination. Heard about these free viewings of interviews on filmsfortheplanet in April, one is about imagining a better future, might be of interest to you for your research?